If you’re a resident of San Diego County, it’s likely you’ve been overcharged for water by the LA-based Metropolitan Water District of Southern California (MWD). 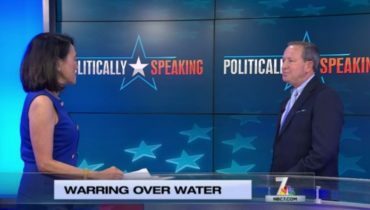 Jim appeared on NBC San Diego’s Politically Speaking in summer 2017 to shed light on the overcharges and reckless practices of MWD. Jim believes that San Diegans should know water bills are high because MWD has been overcharging them, to the tune of $189 million during the past few years. Rather than returning the over-collected money to ratepayers, MWD spent it, then proceeded to overspend its budget by $1.2 billion outside of their approved between 2013 and 2016, causing MWD to authorize another $900 million in unplanned borrowing to cover its out-of-control spending. Some unexplainable purchases made by the MWD include $300 million on turf rebate programs and the purchase of islands (yes, islands) in the Sacramento Bay Delta, costing $175 million without seeking appraisals. As Vice Chair of the San Diego County Water Authority, Jim is the region’s ratepayer watchdog, and he strongly believes that MWD’s reckless behavior hurts local families and businesses. “We have only four representatives from San Diego on MWD’s Board. So, what we’re trying to do now with our outreach program, is to get other members of the MWD Board to ask the same tough questions as we are from San Diego,” said Jim. In a naturally semi-arid area, Jim believes those that are in charge of allocating water (like MWD) need to be fiscally responsible, have a healthy operation and act in a transparent manner with the public. Despite the pushback from MWD, the San Diego County Water Authority pushes onward towards increased water reliability. By 2021, Pure Water San Diego is expected to be underway, providing the City of San Diego with additional 30 million gallons of water per year. The Carlsbad Desal Plant is now online and producing 50 million gallons of water per year – that’s a total of 80 million gallons San Diego no longer needs to purchase from MWD. The Water Authority has been transitioning away from its dependency on MWD. In 1991, almost all San Diego’s water was purchased from MWD. Today it’s around 65 percent and is projected to be 13 percent by 2035.